I was privileged to be asked to speak at the APIC New England Conference today in Springfield, Massachusetts. It was a vibrant day, and congratulations to the organizing committee for putting on such an enjoyable event. Marie-Louise Landry MD – Continuing conundrums and controversies in the laboratory diagnosis of Clostridium difficile. Toxin: cytotoxicity cell culture assay (complex and requires overnight incubation) or enzyme immuno assay (terrible sensitivity). Bacteria: culture (slow and doesn’t tell you much) or rapid GDH antigen assay (sensitive, but requires a confirmatory test of toxigenicity). Bacteria capable of producing toxin: toxigenic culture (requires incubation) or Nucleic Acid Amplification Test (NAAT) such as PCR or LAMP (rapid, expensive). To be honest, before Dr Landry’s talk, I thought that testing for CDI was pretty much sorted: GDH as a sensitive screening test following by PCR to detect the toxin gene for GDH positives. However, Dr Landry presented a compelling case that whilst GDH makes sense as a screening test, detecting the toxin gene via PCR is only half the story: the real gold-standard test is a cytotoxicity cell culture assay to confirm that the disease-causing toxin is present. Cost & clinical association makes compelling case for cell culture cytotoxicity assays; convenience for PCR! Indeed is the initial enthusiasm for PCR CDI testing waning as reality sets in (like the famous ‘Going and Coming’ by Rockwell)? A final point for discussion: you can have the best laboratory diagnostics in the world, but if you’re testing inappropriate specimens, you’ll end up with false positives. We need a firm “no diarrhea, no CDI diagnostics” rule! Dr Donskey began by considering that no healthcare facility is an island, and that long-term care facilities are an integral part of CDI spread. Dr Donskey spent most of the talk considering the environmental considerations related to CDI. Why does cleaning fail? Due to poor implementation: a research team with a bucket of bleach can eliminate C. difficile from surfaces! Various tools are available to help us tackle C. difficile environmental contamination. However, fluorescent markers and UVC did not eliminate C. difficile contamination whereas carefully enhanced disinfection did; bleach goes round corners better than UV, apparently. A related (and under-reported) unintended consequence of introduction a “no-touch” room disinfection (NTD) system such as UVC is that cleaners stop cleaning, mistaking UVC for magical cleaning robots! Plus, you could find yourself spending more time screening than cleaning, to the extent that those tasked with monitoring the cleaning process would be better deployed by getting their hands dirty! Dr Donskey covered a number of other important environmental issues: who cleans what (“the nurses thought EVS were doing it; EVS thought the techs were doing it; nobody was doing it”), the need for daily disinfection, pre-emptive and extended isolation, the potential and under-recognized importance of proper daily bathing for CDI patients, and the potential contamination risk from asymptomatic carriers. The final word: “getting doctors to prescribe antibiotics appropriately is like getting EVS to clean properly: an ongoing challenge.” Oh, and he finished on a song. You can download my slides from the talk here. The talk was loosely based around a review paper recently published in JHI. The increased risk from the prior room occupant argues for doing a better job of terminal disinfection. The goal of hospital disinfection is controversial: the ‘Pragmatist’ says a reduction in contamination is good enough, whereas the ‘Prior room occupantist’ says elimination of pathogens is required. I presented some data suggesting that transmission risk ∝ contamination level; ergo reduction in transmission ∝ decontamination level? 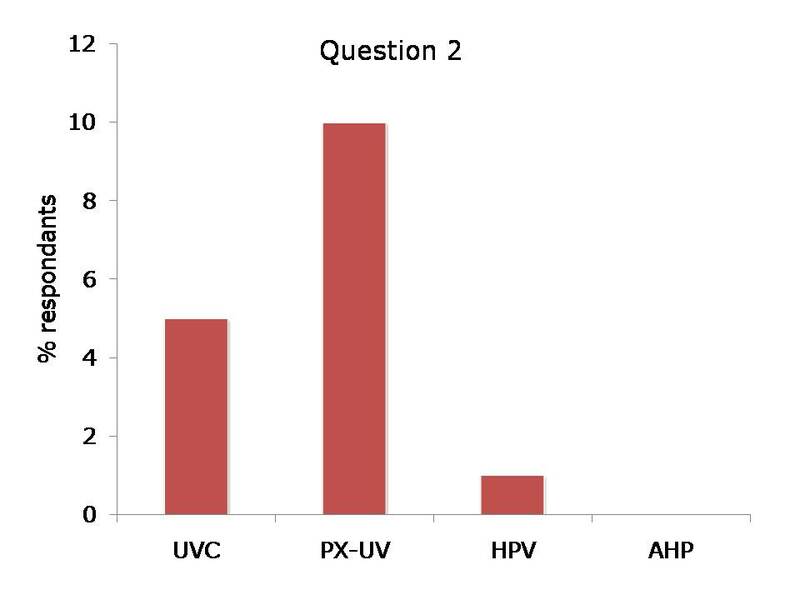 The NTD scene is a four-horse race currently, with hydrogen peroxide vapour (HPV), aerosolized hydrogen peroxide (AHP), ultraviolet C (UVC), and the relatively new kid on the block, pulsed xenon UV (PX-UV). Each system has its pros and cons so which is best? 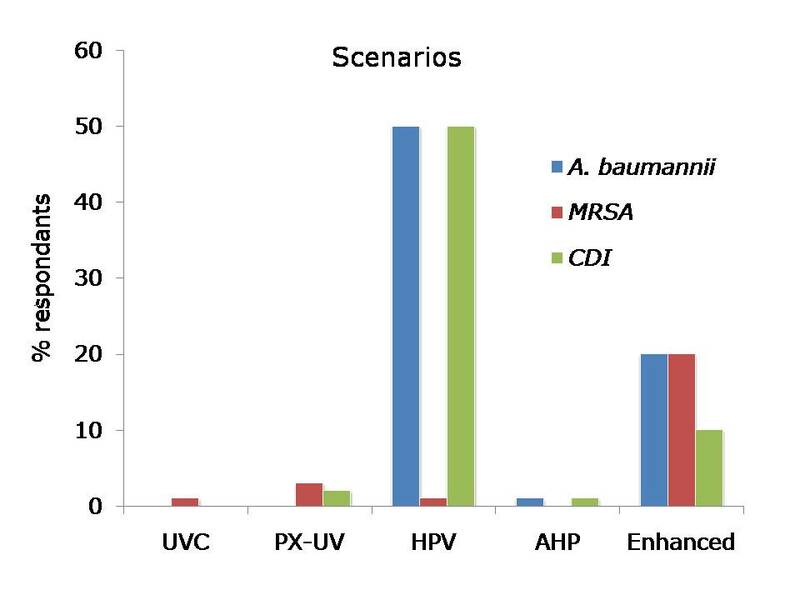 My view is that will depend on the scenario: if you have a carbapenem-resistant Acinetobacter baumannii in your ICU, then the ‘belt and braces’ approach of HPV is warranted. However, if you have MRSA colonization on a medical ward, a ‘quick and easy’ UV treatment may the only feasible option. 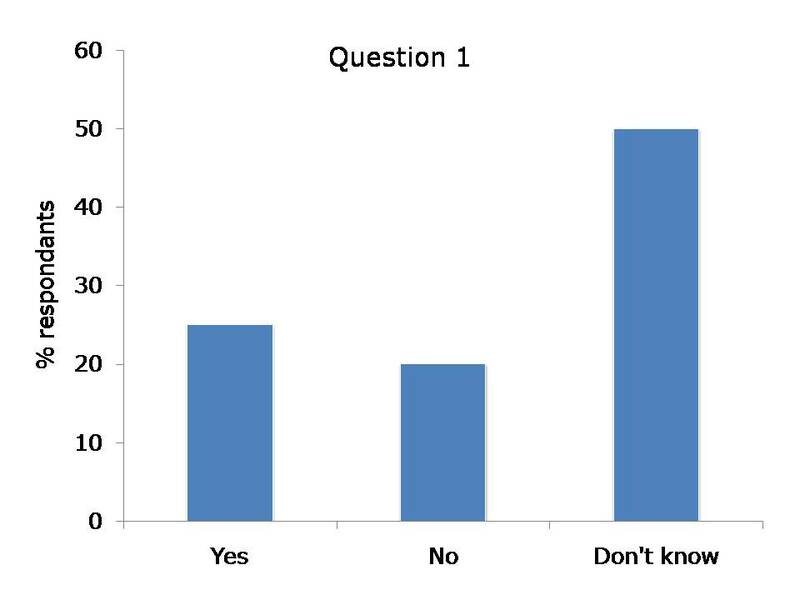 To try to keep everybody awake after lunch, I polled the audience on a few questions (Figure). I was not surprised that most people had not used an NTD system. However, I was surprised that so few people selected UV in the scenarios! Figure. Question 1: Should all acute hospitals be using a ‘no-touch’ automated room disinfection (NTD) system for terminal disinfection of some patient rooms? Question 2: Has your hospital has used the following NTD systems? Scenario 1: A patient with carbapenem-resistant A. baumannii is discharged from the ICU. Scenario 2: A patient with MRSA colonization is discharged a general medical unit. Scenario 3: A patient with recently resolved CDI is discharged from a general medical unit (‘Enhanced’ = enhanced conventional methods). Mike McCarthy rounded off the day with an engaging overview of his experience from a number of industries of how to ‘sustain your gains’. There’s a temptation from administrators to dismantle the team once it has been shown to work; clearly, the results will disappear with the people! Mike gave useful advice on how to embed change in an individual and organization. Do not confuse respect for people with respect for their bad practices. We need to be good coaches of best practice – reinforce proper execution; correct improper execution. The typical number of audits is “once and done”, but this not enough to form good habits. Establishing a new habit takes 60-90 days of work to reach the happy state of ‘unconscious competence’. People like data-led feedback (we’re all nerds at heart), which results in tangible performance management and improvement. So, implement a checklist, audit it, provide positive reinforcement and feedback and your gain will be sustained! Laboratory diagnostics are only part of the story. We need to focus on making sure only appropriate specimens are tested. Dr Donskey mentioned that a shocking 12% of their stool specimens were not tested due to sample leaking or labeling errors. Unfortunately, the stools most likely to be from CDI are also most likely to be liquid! Conversely, testing formed stools doesn’t do anybody any favours. Do we need to focus on asymptomatic toxigenic C. difficile carriers and, if so, how? How far can conventional methods go in tacking environmental contamination with C. difficile and is it time to turn to NTD systems, at least some of the time? How best to sustain our gains? I’m so glad you enjoyed the program – especially that amazing speaker we got to cover the graveyard shift! This is an excellent glimpse at the thought provoking, educational presentations provided yesterday. I’m so looking forward to APIC New England’s next program in October!! One of the best programs that I have attended! Thank you Jon for keeping us wide awake after lunch with your great presentation on No-touch room disinfection systems. It was a pleasure to meet you. Dr. Landry’s Continuing Conundrums and controversies in the Laboratory Diagnosis of Clostridium difficile was eye opening. Always a pleasure to hear Dr. Donskey speak and it was nice to end the day with motivational speaker, Michael McCarthy. I’m looking forward to APIC New England’s next conference! Thank-you Laurel. It was very good to meet you. I made to feel very welcome by you and your colleagues, notwithstanding my strange British ways. I thoroughly enjoyed the programme too.